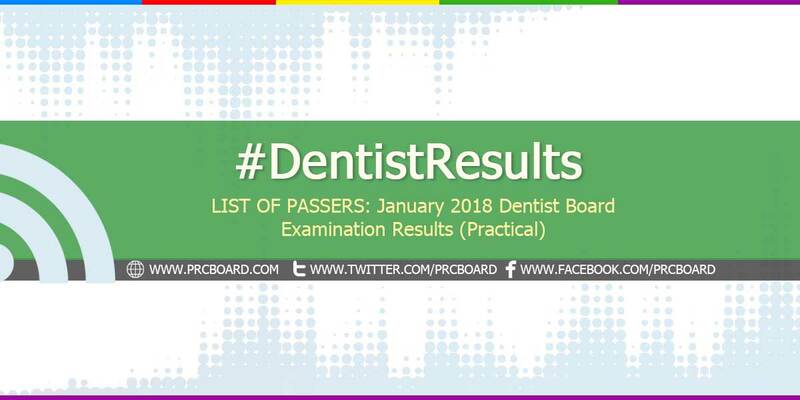 MANILA, Philippines – The January 2018 Dentist board exam results (practical phase) including the list of passers, top 10 examinees, top performing schools and related announcements are available at this website as PRC officially released the results online two (2) working days after the last day of board examination. As announced, 763 out of 769 passed the practical exams. On its written phase conducted December 2018, PRC announced a total of 762 passers out of 1,484 examinees. The Dentist licensure exams are administered by PRC Board of Dentistry headed by the Officer-In-Charge, Dr. Roberto M. Tajonera and its members, Dr. Rannier F. Reyes, Dr. Melinda L. Garcia, Dr. Gloria M. Bumanlag and Dr. Maria Jona D. Godoy on January 3-6, 2018 at PRC testing center in Manila. The schedule of online appointment for issuance of Professional ID and Certificate of Registration will start from January 16-19, 2018. Registration requirements: duly accomplished Oath Form, Notice of Admission (for identification), 2 pieces of colored passport ID picture with white background and nametag, 2 sets of doc stamps and 1 piece of short envelope with name and profession written. As per Resolution No. 2017-1068 entitled "Schedule of Licensure Examination for Year 2018", the target release of January 2018 Dentist board examination result will be on January 10, 2018 (Wednesday) or three (3) working days after the last day of practical exams. Take note that it may also be out earlier or later than the target dates without prior notice. Meanwhile, on the same exams conducted by PRC on January 2017, results were out in two (2) working days while on June 2016, results were released after three (3) working days. The 3 days-written phase exam in the May 2017 Dentistry covered topics from General and Oral Anatomy and Physiology, General and Oral Phatology, General and Oral Microscopic Anatomy and Microbiology, Restorative Dentistry, Public Health and Community Dentistry, Prosthetic Dentistry, Roentgenology, Oral Diagnosis and Surgery, Anesthesiology and Pharmacology, Pediatric Dentistry and Orthodontics, Dental Jurisprudence, Ethics and Practice Management, Periondontics and Entodontics. The practical phase covered areas from amalgam exam, fixed partial denture examination, removable partial denture design exam and complete denture with live patient. On the most recent exam written exam conducted December 2018, 762 out of 1,484 examinees passed. Complete list of passers and related results are posted here. On December 2016, 605 out of 1,150 passed the written phase and 609 out of 613 passed the practical phase. Allan Fred Garcia Camungol from Centro Escolar University in Makati ranked first in the exams garnering 84.30% rating followed by Patricia Mae Mabiog Zara from UP Manila having 84.10%. During June 2016 of the same test, 329 out of 734 passed the written phase and 356 out of 359 passed in the practical phase. Michail Quebec Francisco from Centro Escolar University Manila ranked first garnering 85.30% rating followed by Aileen Chua Lim, also from CEU Manila having 84.03%. Below is the summary of Dentist board exam results (written and practical) in the last three (3) exams. To receive up-to-date news about January 2018 Dentistry board examination results, we advise our visitors to bookmark this page, visit PRC official website or follow us at our social media pages via Facebook and Twitter.